When we first met our lovely Bride, Sarah, she said no she didn’t, although she did have a gorgeous Mint & Gold box of Betty’s Handmade Chocolates which she said she would love to have as the ladies favours. 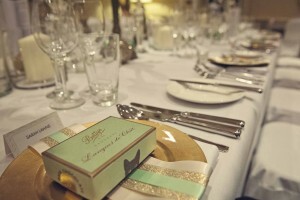 The question had been answered, and we got to work designing and creating Sarah & Ed’s stunning Mint & Gold winter Wedding. 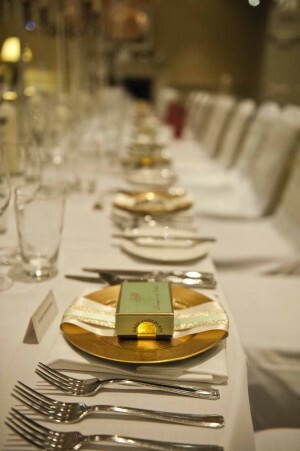 Sarah & Ed had already booked the beautiful Jupiter Suite at the stylish Rudding Park in Harrogate, North Yorkshire for their intimate Wedding celebrations and Sarah’s good friend and ours, Abi at Wooden Hill Images was to capture the happy proceedings with her amazing photographs. 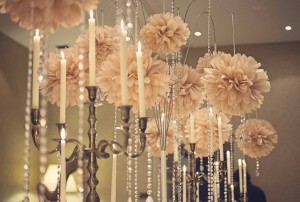 We knew Sarah wanted lots of candlelight for her long table in the Jupiter Suite, so we teamed Antique Gold Candelabra with our fabulous Multi Arm Tablestand centrepieces, a unique tablecentre that we had designed & manufactured in 2011, so that Paper Decorations could be hung above any table without having to attach them to the Venue ceiling. 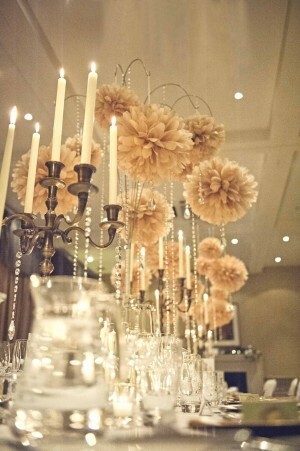 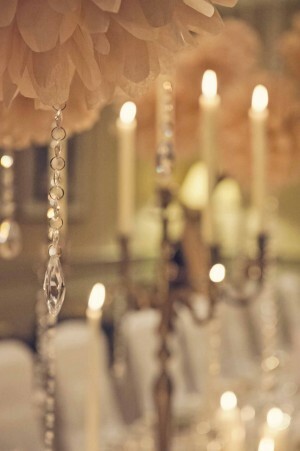 Gold sparkle tissue paper Pom Poms with crystal droplets were hung from the Tablestands and we added long crystal garlands for extra sparkle. 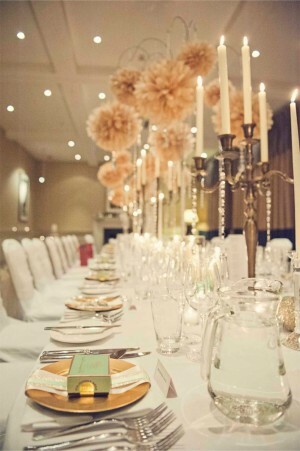 Church candles in cylinder vases nestled at the base of the Candelabra and we placed Mint & Gold sparkle christmas baubles in between. 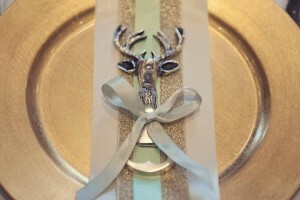 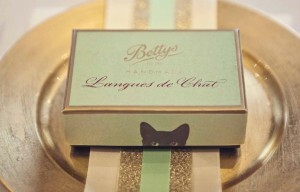 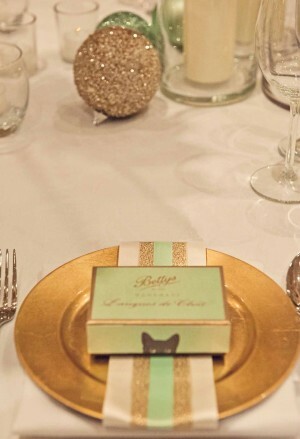 We wrapped large gold charger plates with a mix of gold & mint ribbon and placed silver Stag head bottle openers for the Gentlemen and the iconic boxes of Betty’s Chocolate Langues de Chat (Cat’s Tongues) for the Ladies.